Elucidating the underlying causes of the individually different treatment responses in order to develop new therapeutic or diagnostic concepts based on the findings, is a fundamental goal of Research Area 2. To achieve this goal, it is essential to understand the molecular mechanisms that drive tumor development and progression. Research Area 2 combines the expertise in structural biology, biochemistry and cell biology within the FCI to analyze the tumorigenesis, the response to therapy and resistance mechanisms systematically and functionally in the overall cellular context at the molecular level. In line with the interdisciplinarity of the FCI, the molecular-pathophysiological mechanisms that underlie the clinical observations are elaborated on the basis of individual tumor samples. The close integration of basic scientists with clinicians ensures the focus on clinically relevant issues, access to individual tumor samples and to a broad repertoire of functional tests. 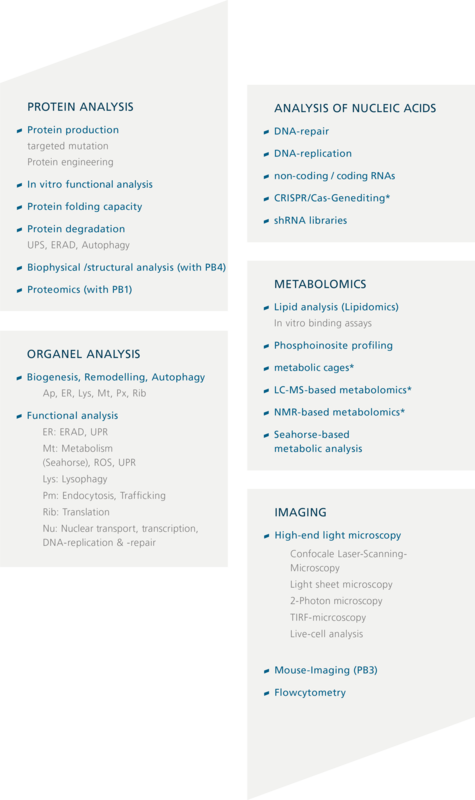 The functional cellular analyzes are the center of Research Area 2 and can be used by all FCI projects. The corresponding technological pipelines are established in the laboratories of the partners involved. One of Frankfurt’s particular expertise is the combination of functional biochemical and cell biological analyzes with structural biological information. For example, the Riedberg Science Campus offers access to protein crystallization rooms and to the Center for Biomolecular Magnetic Resonance (BMRZ), one of Europe’s leading centers for high-performance NMR. The functional cellular analysis is closely connected to the preclinical unit of Research Area 3, since various studies can only be performed with materials such as tumor organoids or from mouse models. The choice of analytical method will depend on the underlying clinical problem, the results of the molecular profiling of the corresponding tumor samples and the results of the first functional screens. The molecular analyzes will not be confined to tumor cells, but will also study host cells in the tumor milieu and their molecular regulation as well as the interaction with the tumor. Research Area 2 is led by Ivan Dikic, one of the co-founders of the FCI and director of the Institute of Biochemistry II at the Goethe University. This area will be considerably strengthened by the newly recruited W2 / W3 professorship for tumor-metabolomics, which will establish a new technological focus in the area of metabolomics. In addition, a W1 / W2 TT professorship for “New Technologies and Autophagy in Tumor Pathogenesis” will be established in this research area. For the biochemical and cell biological function analyzes of the FCI projects, an additional staff scientist and a technical assistant will be recruited.